Nester is having a "Favorite Things Under $30 Party", so I thought I'd share a few of mine! Dunkin' Donuts Blueberry Iced Coffee with no sugar and extra cream. Perfection! 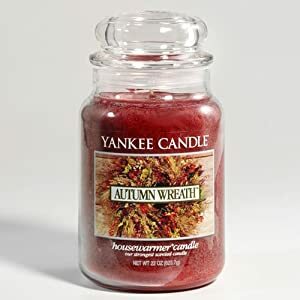 I LOVE Yankee Candles! Autumn Wreath, Harvest, Pumpkin Spice, Red Apple Wreath...I have so many favorites. These candles can be pricey, but are definitely the BEST! Hershey's Bliss Dark Chocolate, need I say more? I am loving these glass jars that are sitting on my counter. Makes storing boring things like flour and oatmeal exiting! So what about you? What are your favorite things under $30?? Someone recently told me that if you put your candles in the freezer for at least 24 hours before you burn them the first time, they will last a lot longer! (She only uses Yankee Candles, so I know it’s safe to put them in the freezer). Of course, you probably already know this :) Congratulations on Lucy Joy! So glad you had a great birth experience! The ability to have a VBAC is a huge blessing! Take care!